Winter is here. With winter comes the challenge of restricted visit to outdoor places like zoo, park, beaches etc with kids. Thinking of where to go for day trips in NJ in winter? Adventure Aquarium Camden NJ can be your sure shot destination in any of these winter weekends. It is a great place for few hours of unlimited indoor family fun in this chilling climate. Just like you , I have a preschooler. And keeping him entertained during his Christmas holiday break was a task, a tough task I must say. When I was looking for day trips in NJ in winter, I came to know about this place. So just a couple of days after Christmas we planned to visit the Aquarium. And here I am going to provide you the snapshot of our visit as this might help you to plan your trip. 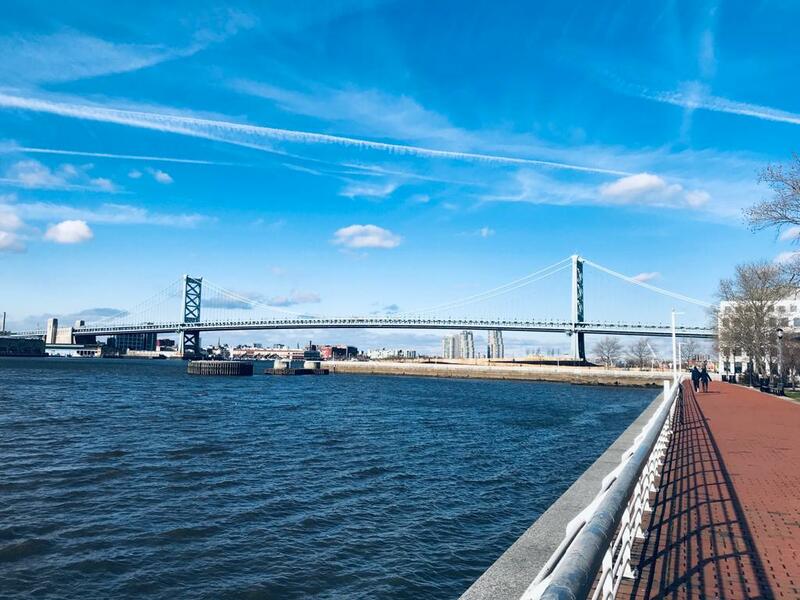 The Aquarium is located at Camden, New Jersey on the Delaware River Camden Waterfront at the border of New Jersey and Philadelphia. It is just across the river from Philadelphia downtown.It is almost 1 hr 30 mins drive from Edison, New Jersey. The location itself is so exotic with a beautiful riverfront and a clean sidewalk. I bet you can not resist to take a stroll and click a few pictures on a nice sunny day. As mentioned in their official site, this beautiful aquarium features one-of-a-kind exhibits with more than 8,500 aquatic species throughout two million gallons of water. Spread over a space of 5 acres it is divided into four zones. It exhibits Hippo Heaven, Creature feature, kids zone, ocean Realm, Piranha falls, Shark bridge and many more. Penguin park is the latest addition to it. You have tons of different options to entertain yourself for hours. The different colours of fish reminded my kiddo of the Dr Sues book One fish, two fish, red fish, blue fish. Crossing the shark bridge was a daredevil task for the little one. Touching the sharks were quite exciting too. Seeing the little cute penguins in a park like set up was mind-blowing. Kids were in awe seeing the huge hippos from so near. Feeding the penguins and Hippos or watching a documentary on sea animals at the 3D-theatre is equally thrilling. It was an amazing experience to visit the Piranha fall. They have aesthetically recreated the Amazon river a vast rainforest, waterfalls and lots of piranha. As we were lucky enough to visit the aquarium during Christmas, we saw eye catchy Christmas decoration throughout the place, on the ground as well as underwater. They beautifully wrapped gift boxes and decorative ornaments and kept them with the sea animals. It was a visual treat to see the world’s largest and no-doubt most amazing underwater Christmas tree. Parking facility– Aquarium has its own parking facility just adjacent to the premises.They have a flat rate of $10 for the whole day. 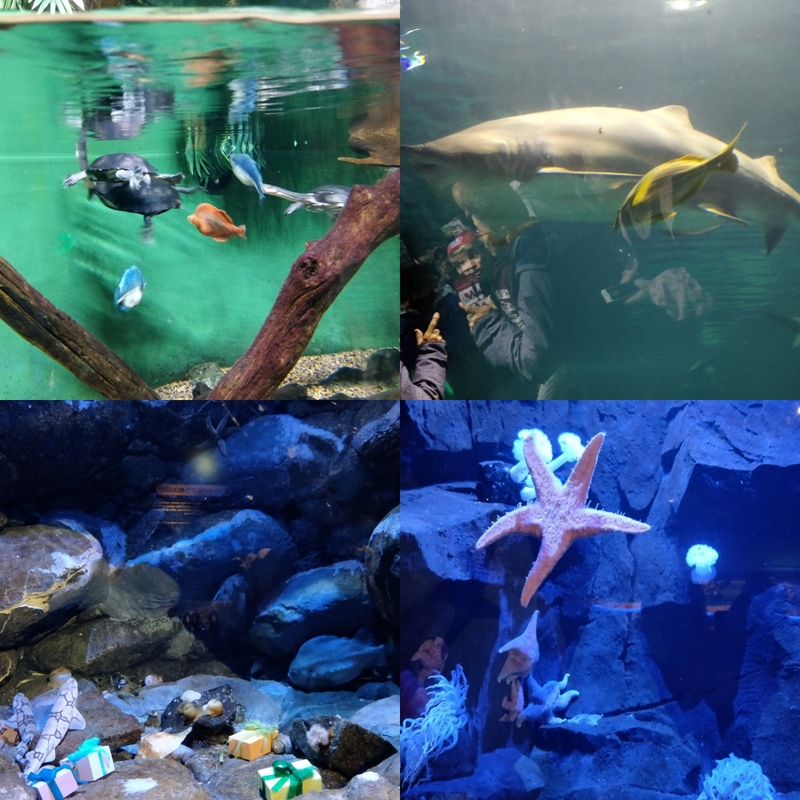 Time required to explore-The Aquarium is open from 9:30 in the morning till 5 p.m.It is up-to you,how much time you want to spend there.But as per my personal experience 3 to 4 hours should be enough to completely explore the place with a lunch break. Locker room:Adventure Aquarium have locker facilities inside the premises to keep your valuables. Strollers : You can carry your own stroller to most of the areas inside except places like Shark bridge.Also you can rent one for $6 dollar from Aquarium. Food court: They have an excellent food court with plenty of options.But if you want to carry your own food,you can do that and allowed to eat at the food court. Gift Shop:I liked their gift shop.Good place to buy some colourful underwater theme souvenir or toys. 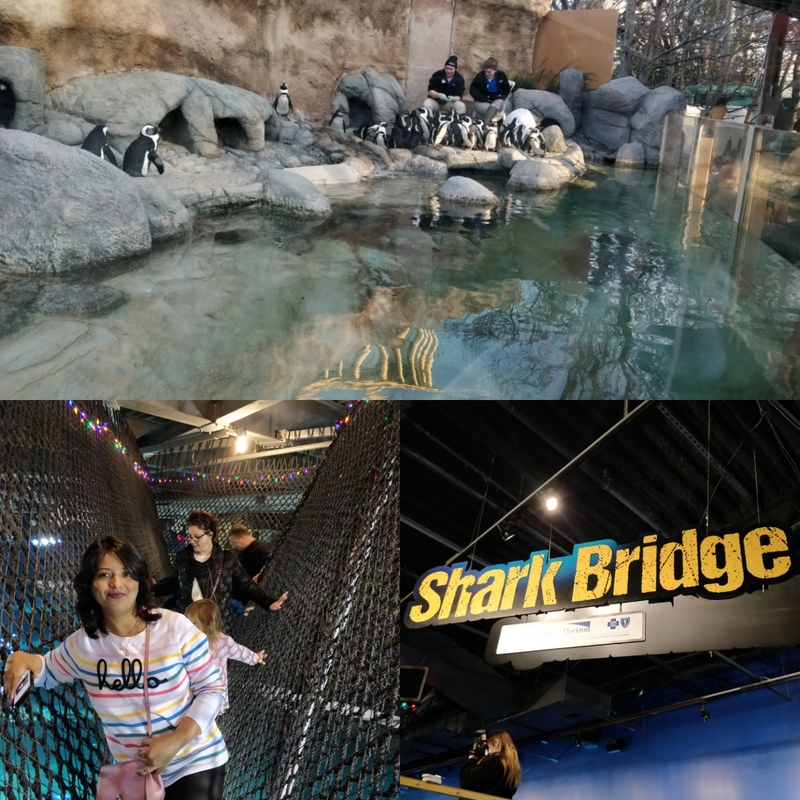 We had an amazing time at Adventure Aquarium.My little one enjoyed a lot.So what are you waiting for?Go book your ticket and plan your trip soon. Thanks dear….I have added this place in my list to visit this winter.. Wow!!! It’s a beautiful place for kids . I love the Christmas 🎄 tree is amazing part. Aquarium. This sounds like a great day well spent. This looks like such a fun place to go! My kids would love it for sure. Such fun places!! Looks like the kids had a great time! This looks like a fun trip especially for the winter. Thanks for sharing. I love New Jersey! & I lived there for most of my life! Nice tips! Thank you for your post and all the pricing list! Definitely helpful post . Have never been in NJ, now i know where to go when I will be there! This looks like such a fun time!! This looks awesome! If we’re in the area we’ll def go! My kids love going to the aquarium, so this looks awesome!! My spouse and I absolutely love your blog and find most of your post’s to be exactly I’m looking for. Would you offer guest writers to write content for you personally? I wouldn’t mind writing a post or elaborating on a number of the subjects you write about here. Again, awesome site!